by Chris Woodford. Last updated: January 31, 2019. If wood is the world's most versatile natural material, nylon is probably the most useful synthetic one. It's a plastic that can be molded into everyday products or drawn into fibers for making fabrics—and its launch in the late 1930s truly changed the world. Don't believe me? Let me explain. You can pretty much live your entire life with nylon by your side. You can snooze away on brushed nylon sheets until your alarm clock (powered by nylon gears) wakes you up. Hop across the nylon rug or carpet to your kitchen, maybe eat your breakfast from a nylon bowl, before cleaning your teeth with a nylon toothbrush. Hold a nylon umbrella over your head to keep out the rain when you set out for work or school or, if the sun's shining and you're heading to the beach, wear your quick-drying nylon swimming shorts instead. Feeling adventurous? You could try jumping from an airplane and have a nylon parachute bring you safely to the ground! Those are just a few of the things that nylon does for us every single day. What makes this material so amazing? Let's take a closer look! Photo: Left: The world was introduced to nylon in 1938 when the DuPont chemical company used the material to make synthetic toothbrushes. Right: You can make nylon bristles pretty much any length. 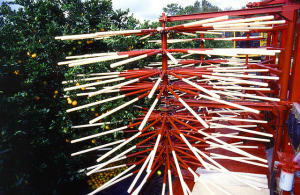 This amazing citrus fruit harvesting machine has nylon filaments that are about 3.5m (~12ft) long. They spin around and shake the fruit gently from the trees. Photo by Keith Weller courtesy of US Department of Agriculture/Agricultural Research Service (USDA/ARS). Nylon is a polymer—a plastic with super-long, heavy molecules built up of short, endlessly repeating sections of atoms, just like a heavy metal chain is made of ever-repeating links. Nylon is not actually one, single substance but the name given to a whole family of very similar materials called polyamides. So whenever we say "nylon is..." it's generally more correct to say "nylons are..."
One reason there's a family of nylons is because the original and most common form of the material, nylon 6,6, was patented by E.I. du Pont de Nemours & Company (DuPont™), the US firm where it was invented, so rivals such as German chemical giant BASF had to come up with alternatives. Another reason is that the different kinds of nylon have different properties, which makes them useful for different things. Other kinds of nylon include nylon 6, nylon 6,12, and nylon 5,10. Two other "fantastic plastics" made by DuPont, Kevlar® (a superstrong material used in bulletproof vests) and Nomex® (a fireproof textile used in racing car suits and oven gloves), are also polyamides and they're chemically related to nylon. Photo: Nylon couldn't wait to became a space-age material. In 1952, NASA rocket scientist Wernher von Braun proposed building a space station out of flexible nylon, which could be carried into space by a relatively small rocket and then inflated like a car tire. That concept never made it off the ground, but nylon still played its part in space history: the flag planted on the Moon by Neil Armstrong in 1969 was made from—guess what—nylon! 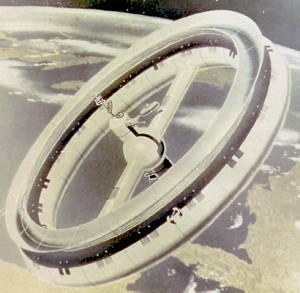 Illustration by Chesley Bonestell courtesy of NASA Marshall Space Flight Center (NASA-MSFC). Unlike traditional materials such as wood, iron, wool, and cotton, nylon does not exist in nature: we have to make it in chemical plants from organic (carbon-based) chemicals found in natural materials such as coal or petroleum. (It's also possible to make nylon from renewable materials; Zytel®, a type of nylon produced by DuPont, comes from castor oil—so, essentially, vegetables.) 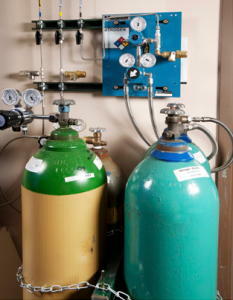 The nylon polymer is made by reacting together two fairly large molecules using moderate heat (roughly 285°C or 545°F) and pressure in a reaction vessel called an autoclave, which is a bit like an industrial-strength kettle. One of the starting molecules is called hexane-1,6-dicarboxylic acid (also called adipic acid) and the other is known as 1,6-diaminohexane (also called hexamethylenediamine). When they combine, they fuse together to make an even larger molecule and give off water in a chemical reaction known as condensation polymerization (condensation because water is eliminated; polymerization because a big, repeating molecule is produced). The large polymer formed in this case is the most common type of nylon—known as nylon-6,6 because the two molecules from which it's made each contain six carbon atoms; other nylons are made by reacting different starting chemicals. Usually this chemical process produces a giant sheet or ribbon of nylon that is shredded into chips, which become the raw material for all kinds of everyday plastic products. Artwork: How nylon 6,6 is made by condensation polymerization. 1) The two ingredients are 1,6-diaminohexane (left, red) and hexane-1,6-dicarboxylic acid (right, black). 2) A hydrogen (H) from the (red) diaminohexane joins with a hydroxide (OH) from the (black) acid. 3) A water molecule (blue) is lost (which is why the process is called condensation) as the two molecules join together. 4) The same thing happens over and over again, making a bigger and bigger molecule from the same repeated components—the process we call polymerization. Nylon clothes and similar products are made not from chips but from fibers of nylon, which are effectively strands of plastic yarn. They're made by melting nylon chips and drawing them through a spinneret, which is a wheel or plate with lots of tiny holes in it. Fibers of different length and thickness are made by using holes of different size and drawing them out at different speeds. Strands are sometimes used by themselves (for example, in the manufacture of stockings) and sometimes tens, hundreds, or even thousands are wrapped together to make thicker and stronger yarns (similar to cotton but far stronger). Photo: Strong and lightweight: clothes aren't the only things made from nylon fabrics. 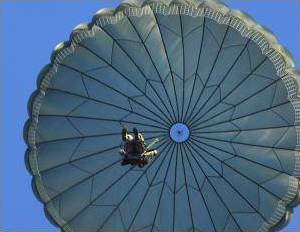 Parachutes were originally made from silk; now they're more likely to be made from "ripstop" nylons. Photo by Senior Airman Micky Bazaldua courtesy of US Air Force. 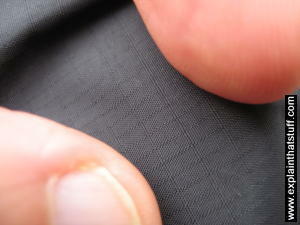 Photo: A closeup of the criss-cross reinforcement in ripstop nylon. These little rectangles are designed to stop rips or punctures from spreading, so a tiny tear won't get bigger by racing through the whole material. In everyday speak, we "measure" the strength of nylon yarn in units called deniers, which is the weight in grams of 9000 meters of the yarn; that's loosely true because thicker and heavier materials are stronger than finer ones. You might have seen stockings for sale marked as "15 denier" without ever really understanding what that means. Roughly speaking, it's an indication of how thick (and therefore how strong) the nylon fabric is, but it's actually a measurement of the weight of the nylon fibers from which it's made. If you see stockings described as 40-denier, it means a 9-km (roughly 6-mile) roll of the yarn they're made from would weigh just 40 grams (1.4 oz)—which gives you some idea just how fine nylon yarn really is! Tights and stockings with higher denier measurements are thicker and stronger; ones with lower denier measurements are more sheer and more fragile. Ultra-sheer tights, for example, are usually less than 10 denier; thick winter tights can be 100 denier or more. However, it's very important to note that scientists are much stricter about all this: the denier isn't a measurement of strength at all. For that, we need to use carefully defined units, such as grams (force) per denier, technically referred to as the tenacity (effectively the breaking strength of a fiber and equivalent to measurements like kilograms per square centimeter or pounds per square inch for conventional materials). Generally, nylon is a silky smooth thermoplastic (which means it melts and turns runny when you heat it up, generally at around 260°C or 500°F) that's strong, tough, and durable (it's reasonably wear-proof and resists sunlight and weathering). Since it's a synthetic plastic, it's highly resistant to attack from such natural nasties as molds, insects, and fungi. It's waterproof (hence its use in umbrellas and waterproof clothes) and fast-drying because (unlike with natural fabrics like cotton or wool) water molecules can't easily penetrate the outer surface. Although reasonably resistant to quite a lot of everyday substances, nylon will dissolve in phenol, acids, and some other harsh chemicals. It's almost easier to say what nylon isn't used for. Look around your home and you'll find it's packed with nylon. 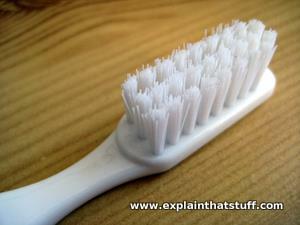 The first products made with this amazingly versatile chemical were toothbrushes and women's stockings. Later it was used in everything from tennis rackets and parachutes to inexpensive machine gears, fishing lines, and nylon rugs. Some cars even have body parts made from nylon! Photo: Chemical laboratory courtesy of NASA Glenn Research Center (NASA-GRC). Everyone's heard of nylon, but hardly anyone outside the world of chemistry knows the name of Wallace Carothers (1896–1937), its brilliant, enigmatic, and ultimately tragic inventor. Carothers was a promising academic chemist working at Harvard University when DuPont™ lured him to its Wilmington, Delaware headquarters in the late 1920s. His job was leading a research team that was experimenting with polymerization and he scored an early success with the invention of neoprene, a synthetic rubber now best known for its use in wetsuits. 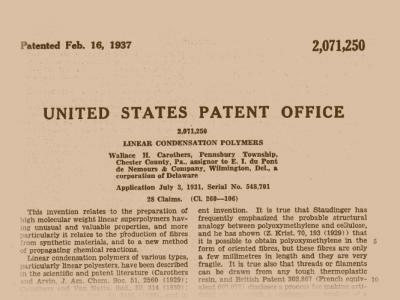 Photos The front page of Wallace Carothers' patent for nylon (US Patent 2,071,250: "Linear condensation polymers" courtesy of US Patent and Trademark Office). In spring 1930, one of the Carothers team, Julian Hill, accidentally produced a strange gooey blob of material that he could draw out into long, thin fibers. After further research and development, this material became nylon 6,6—the world's first commercially successful synthetic polymer—and DuPont patented it a few years later. This should have been a triumph for Carothers, but he'd been plagued by alcoholism and depression for some time and personal problems had ground him down. Tragically, he found life unbearable and committed suicide in a Philadelphia hotel in 1937. The year after his death, DuPont launched nylon commercially, initially in plastic toothbrushes. Two years later, in 1940, the new material caused an incredible sensation when the first nylon stockings went on sale—something like 5 million pairs were sold on the first day alone! In his nine years at DuPont, Wallace Carothers filed over 50 patents, but doubt about the value of his work was one of several factors that had apparently driven him to his death. If only he'd known how important his work was about to become. Today, he is rightly regarded as a pioneer of synthetic materials and considered one of the most important chemists of modern times. Fibers and Fabrics: A guide for students and teachers that describes the world of modern textile science, from the UK's National STEM Centre. Wallace Hume Carothers and Wallace Carothers and the Development of Nylon: Two great pages telling the story of how Wallace Carothers and his DuPont colleagues developed nylon. February 23, 1935: Sheer bliss by Tony Long. Wired, February 28, 2011. Celebrating the first production of nylon by Du Pont. Julian W. Hill, Nylon's Discoverer, Dies at 91 by David Stout. The New York Times, February 1, 1996. An obituary of Wallace Carothers' important colleague. New Nylon Fiber Found: Strong, Warm Fabrics Believed Possible From Product: The New York Times, November 23, 1946. This article from the Times archive hails the discovery of a revolutionary new type of nylon. Giant Molecules: From Nylon to Nanotubes by Walter Gratzer. Oxford University Press, 2011. Where do huge polymers come from and what can we do with them? Nylon and Bombs: DuPont and the March of Modern America by Pap A. Ndiaye. Johns Hopkins University Press, 2007. How DuPont's development of nylon and plutonium turned the 20th century into the plastics and nuclear age. Enough for One Lifetime: Wallace Carothers, Inventor of Nylon by Matthew Hermes. Washington, DC: American Chemical Society/Chemical Heritage Foundation, 1996. This definitive biography of Wallace Carothers is quite hard to track down but it's well worth a read if you can find it. Nylon: The Story of a Fashion Revolution by Susannah Handley. Johns Hopkins University Press, 1999. This wide-ranging book covers the social, scientific, and technological history of nylon. US Patent 2,071,250: "Linear condensation polymers": In this patent (granted February 16, 1937), Carothers describes the chemistry behind "high molecular weight linear superpolymers having unusual and valuable properties". US Patent 2,130,523: "Linear polyamides suitable for spinning into strong pliable fibers": A follow-up patent on making nylon fibers, granted on September 20, 1938. "Nomex," "Kevlar," "Zytel," and "DuPont" are trademarks or registered trademarks of E. I. du Pont de Nemours and Company.